At 10:00 p.m. of March 20, 2013, Filipino-Chinese Shinlian Association banqueted China Boai Medical Investment Group Chairman Lin Zhicheng and his delegation in Royale Seafood Restaurant, Manila city. 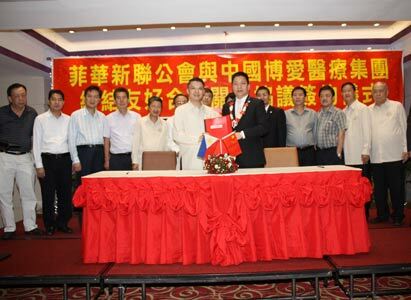 During the banquet, a contract signing ceremony was held to celebrate the establishment of a friendly and cooperative relation between two sides. That night Royale Seafood Restaurant was immersed in a festival atmosphere and filled with laughter and joy. Secretary anson uy hosted the ceremony and Chairman Mariano Ong started the banquet with a speech. “In such a warm spring when flowers are in full bloom and all things take on a new start, we are delighted to welcome our folks ----China Boai Medical Group Chairman Lin Zhicheng and his delegation from our homeland. Here, please allow me to represent the staff of Filipino-Chinese Shinlian Association to express our warmest welcome to your arrival! Since its establishment more than three decades ago, Filipino-Chinese Shinlian Association has won universal praise and its business is on a steady development under the guidance and care of the Chinese Embassy in the Philippines, and the constant effort of all previous leaders and supervisory personnel. All members of the association devote themselves to drive the economic and cultural exchange between China and the Philippines, meanwhile, promote Sino-Philippine friendship. Moreover, they also actively spread their love, sincerely contribute to the society and enthusiastically support the charity cause in both the Philippines and China. They care for health of sisters and brothers in poverty districts of the Philippines, join hands with free medical consultation center in Manila Chinese communities to give patients free medicine and consultation, serve the Philippine public, help those in poverty and provide relief to disaster-stricken people, as well as save no effort in donation. China Boai Medical Group is a modernized group enterprise with medical investment, hospital management and clinical medical service as leading industries. It is one of the biggest medical investment groups in China and one of the World’s Top 100 Medical Groups. After a period of time of contact, talk and discussion with manager He Langbing of Boai Medical Services Inc. in the Philippines, we realized that we have the same mission and similar contribution spirit with Boai Medical Services Inc.. Therefore, today we are here to hold this grand signing ceremony to cerebrate the establishment of our friendly and cooperative relation, to show our will of fighting for people’s health of the two countries and make effort to negotiate about new medical service standard and promote new development of medical technology, so as to benefit more Philippine and Chinese patients. We believe that through communication and exchange as well as cooperation, we will be able to realize double wins, strengthen Sino-Philippine friendship, deepen cultural exchange and economic, trade cooperation, and score more brilliant achievements”, said Chairman Mariano Ong. Then China Boai Medical Group Chairman Lin Zhicheng (Vice President of the China Health Law Society, Honorary President of the Medical Research Institute of Guangdong Province, one of the Ten Outstanding Leaders of Excellent Enterprise Culture in Guangdong Province) made a speech. He expressed his appreciation to Filipino-Chinese Shinlian Association for their friendly reception, which made him feel at home. He introduced to everybody the mission and structure of the group and pointed out that the group has the same goal with Shinlian Association, which is hoping to serve the whole Philippine and Chinese society and help more patients. Chairman Lin Zhicheng also indicated that they will save no effort to provide better medical services to patients. Later, the signing ceremony was started. Chairman Mariano Ong and Chairman Lin Zhicheng represented both sides to sign in the agreement contract. Other leaders of Filipino-Chinese Shinlian Association, the members of China Boai Medical Group delegation and other participants present in the event saw the exciting moment, which signified the two sides will make more effort for Sino-Philippine people’s health, to negotiate about new medical service standard and to drive new medical technology development, so as to give more Philippine and Chinese people benefit. At last, the two sides gave each other souvenirs and took pictures together. Thus, the signing ceremony came to an end in a harmonious atmosphere.